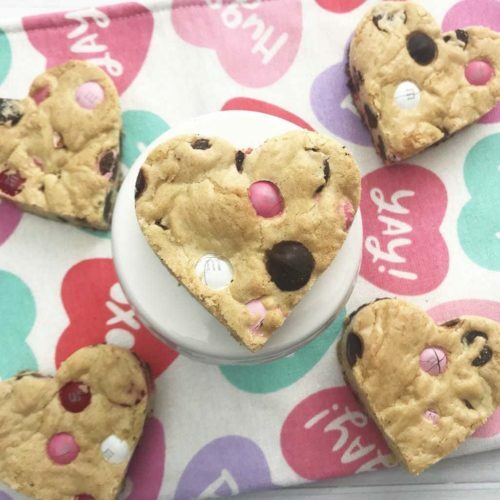 These Chocolate Chip Heart Shaped Cookie Bars are the one Valentine Day treat that you just can’t miss! Not only are they simple, but their heart-shaped and full of love! With Valentine’s Day literally right around the corner, sweets are probably are on the forefront of your mind. Hearts, candy, chocolate…you name it, it’s all good and it’s all readily available. If you’re anything like me, you like the idea of buying a dessert from the store, but deep down you know that homemade desserts are just so much better. This is why this Valentine’s Day, these Chocolate Chip Heart Shaped Cookie Bars need to be on your baking radar. They’re obviously adorable, but also super simple as well. These heart-shaped treats are certain to be the hit of your home or anywhere else that you decide to take and share. Perfect for school class-parties as an ending dessert to your Valentine’s Day dinner, you just can’t go wrong with these delicious homemade treats! Plus, they’re packed full of M&M’s and chocolate…and if that doesn’t say love, I don’t know will! 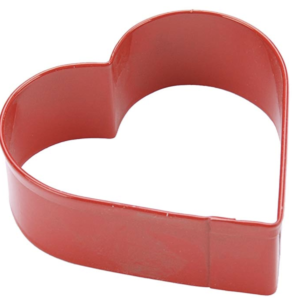 To make these cookie bars into heart shapes, grab one of these heart-shaped cookie cutters! Can you make these cookie bars for other holidays well? Is it possible to use unsalted butter with this cookie recipe? The fun red and pink M&M’s make for a beautiful sight in these heart cookie bars and make them perfect for Valentine’s Day. If you can stop from eating more than one, you’re better than me! Of course! M&M always has fun selections and colors of their candy, so you can make these for Christmas, Easter, and even Halloween. All you need to do is change out the color of the M&M’s and find a new cookie cutter to make your shape, and you’re in business! Yes, you can use unsalted butter but you’ll need to add a little bit of salt to the recipe to compensate for that fact. 1. Preheat the oven to 350 degrees and line a 9×9 baking dish with foil. Spray with non-stick cooking spray. 2. 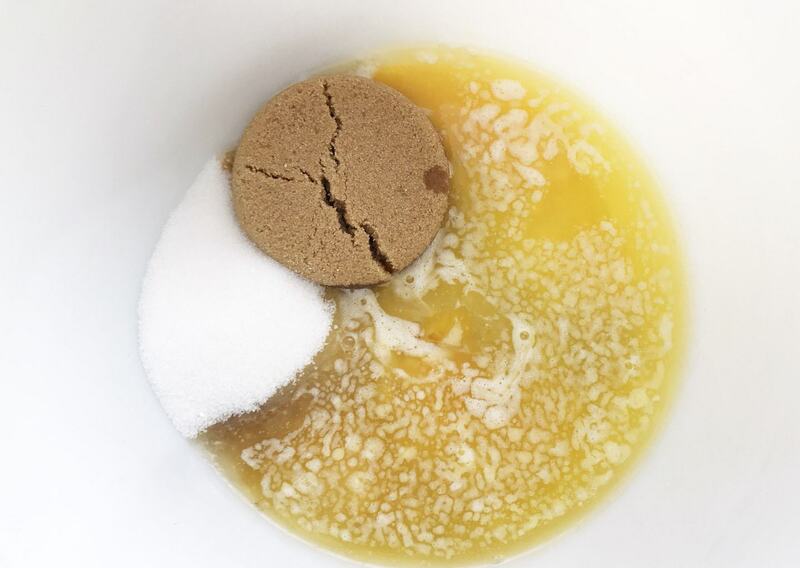 Combine the melted butter, brown sugar, granulated sugar, eggs and vanilla. 3. Slowly fold in the flour and baking powder. 4. Add in the chocolate chips and Valentine M&M’s. 5. 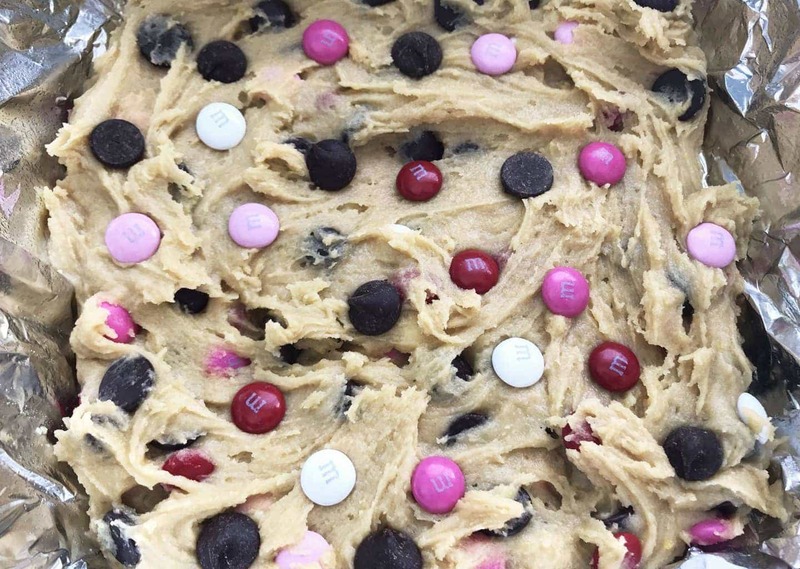 Pour the cookie dough into the prepared baking dish and press a few extra chocolate chips and Valentine M&M’s on top. 7. Remove from the oven and let cool completely before cutting into heart shapes. 8. Once the cookie bars have cooled, gently lift them from the baking dish using the foil. Use the Heart cookie cutter to cut out the cookie bars and close together as possible alternating the cookie cutter up and down. Have fun with the heart cookie cutter options out there! You can make these big hearts or small hearts or a combination of both! If you happen to have any leftover, you can eat them over the next few days or even put them into a freezer safe container to enjoy later! 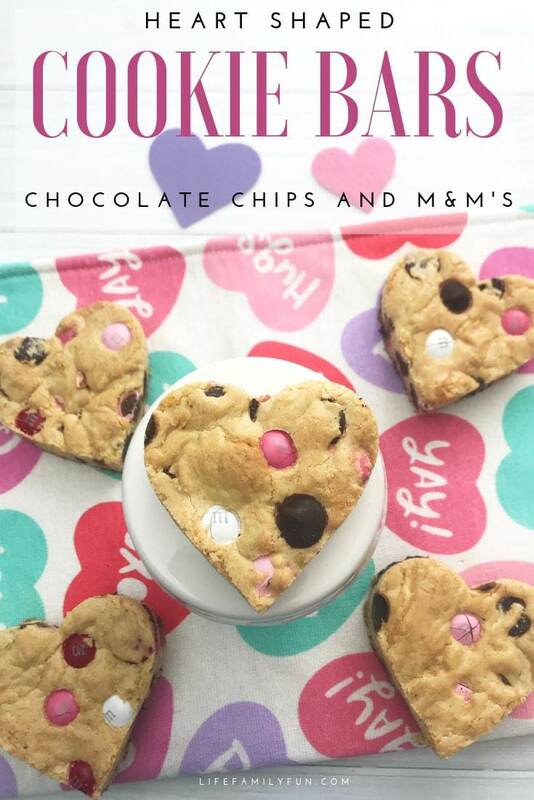 These Chocolate Chip Heart Shaped Cookie Bars are the one Valentine Day treat that you just can't miss! They are simple to make and full of love! Combine the melted butter, brown sugar, granulated sugar, eggs, and vanilla. 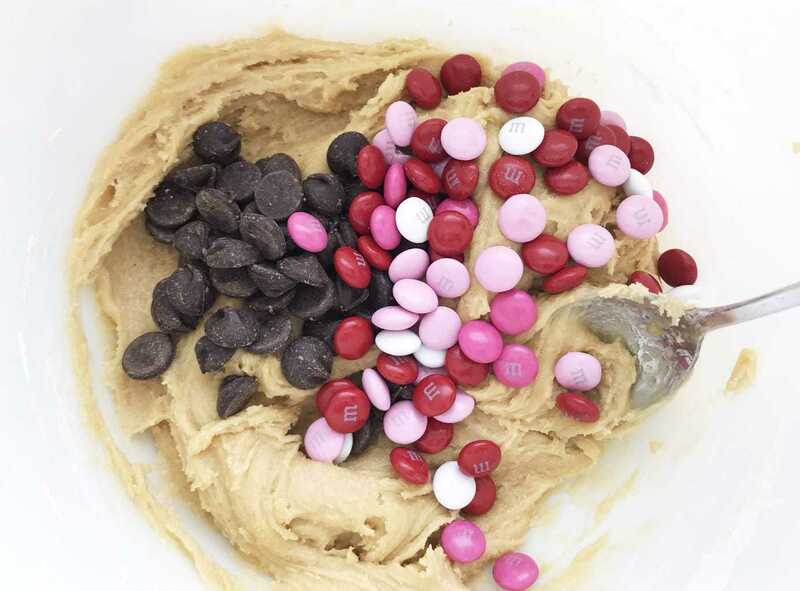 Pour the cookie dough into the prepared baking dish and press a few extra chocolate chips and Valentine M&M's on top.